This means Liz and I will act as co-presidents for club governance purposes. 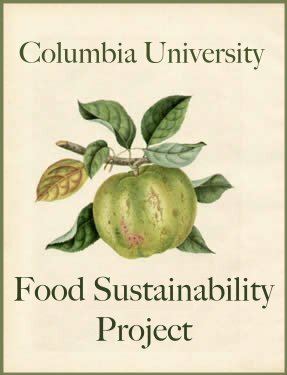 - Liz is arranging to meet with Margaret Hoffman of the Greenmarket and Dining Services to discuss future local foods purchasing. Particular concerns are quantity and insurance. - Liz is meeting with Ina Tsagarakis, Dining Services nutritionist, about food labeling and posting nutrition facts online. - Reusable containers for John Jay takeout: Liz will research this project this summer. This year, we need someone to create an online student survey to find out more about students’ use of take-out containers. VOLUNTEERS??? o There will be a video displayed soon in John Jay showing how Dining Services works with City Harvest to distribute extra food produced by John Jay. o Trayless Thursdays will be piloted in John Jay next year, to discourage people from taking too much food (then tossing it). - Because we haven’t finished planting and haven’t set up irrigation, watering the plants consists of filling up a container with water from the Pupin bathroom and making a few trips back and forth to the garden site. I’ve been watering the herbs thus far—can someone volunteer to check the plants Friday and water them if necessary? It’s fun! - This SATURDAY at 2pm we will be finishing the trellises, cleaning the compost bins, and doing a little weeding/garden maintenance. Come to Pupin Plaza to help out! § Summer garden point person—possibly Becky, but please let me know if you are interested in this position! - Best of all—our final planting date will be May 10th at 3pm! Only a few more weeks to go! For those who can’t make it Saturday, we will meet again this Sunday at 8pm in Math 520. Why Bother with Urban Gardening? Yet another quality article from Michael Pollan, addressing not just food issues (though he gives gardens particular notice!) but environmental action of all sorts. His driving point, which dovetails perfectly with FSP's garden aims, is that people need to stop relying on policymakers and scientists to find a catchall solution to our environmental woes. Rather, we need to physically change how we live. Read the full piece, part of the NY Times Magazine's "Green Issue," here. "But the act I want to talk about is growing some — even just a little — of your own food. Rip out your lawn, if you have one, and if you don’t — if you live in a high-rise, or have a yard shrouded in shade — look into getting a plot in a community garden. Measured against the Problem We Face, planting a garden sounds pretty benign, I know, but in fact it’s one of the most powerful things an individual can do — to reduce your carbon footprint, sure, but more important, to reduce your sense of dependence and dividedness: to change the cheap-energy mind." REMINDER: The next FSP meeting will be 8pm this WEDNESDAY in the Piano Lounge, then it will be back to our regular date/time. Garden update soon to come.